Quick and easy pasta using only a few ingredients. Bring a pot of water to the boil, add pasta and cook for 4-5 minutes. Meanwhile, heat a non-stick fry pan and gently fry sliced chorizo. Remove from the pan, drain on paper towel. Using the chorizo oil in the pan, fry diced tomatoes for 5 minutes or until until they soften. Return the chorizo and add the peas, cook a further 2 minutes and add cooked penne. Stir until all ingredients are combined. Notes... This recipe is easily adapted by adding grated zucchini, fresh herbs, ham or bacon. Lovely and simple. Thanks for the recipe. 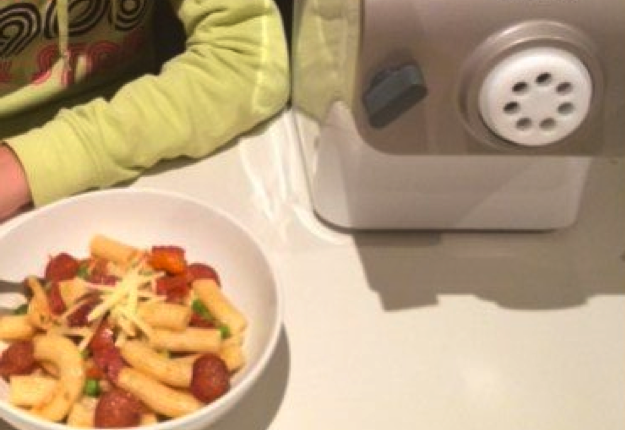 After seeing all the positive reviews of the pasta machine, I’m dying to get one! Your recipe combo, sounds delicious! worth a try…and it looks so fabulous…..
Chorizo is excellent with pasta,might add a touch of chilli,thanks! thankyou for creating and sharing this. it really does look good. Good recipe & versatile too .Which is great . 4 ingredients? Love it! Looks yummy so will have to try it. I bet my youngest would especially love it. Chorizo is so good in pasta dishes – yum! Looks very delicious and easy to make. Perfect for dinner. Thanks for sharing this penne pasta recipe.